Is áit iontach shuimiúil stairiúil í Cluain Dolcáin. Bhunaigh Naomh Crónán mainistir i gCluain Dolcáin timpeall 600 AD. Thóg na manaigh an Cloigtheach timpeall 100 bliain ina dhiaidh sin. Tá sé déanta d’aolchloch (limestone) agus tá eibhear (granite) le feiceáil timpeall an dorais agus na bhfuinneoga. Tá sé 27.5 méadar ar airde. Tá an doras suite 4.2m ón talamh. Is é 'Cumann an Chloigthigh' an Cumann Lúthchleas Gael áitiúil. 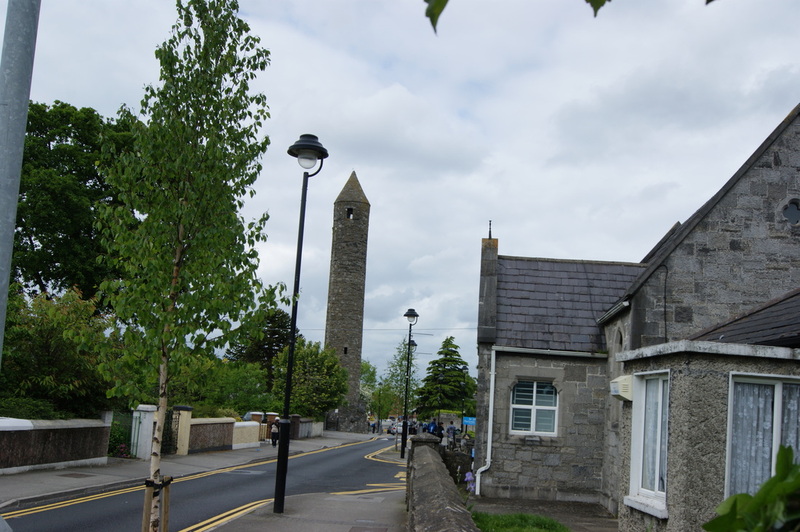 Saint Crónán founded a monastery in Clondalkin around the year 600 A.D. About 100 years later the monks built the round tower. it is built of limestone with granite used to edge the door and windows. The tower is 27.5 metres in height and the door is 4.2 metres from the ground. 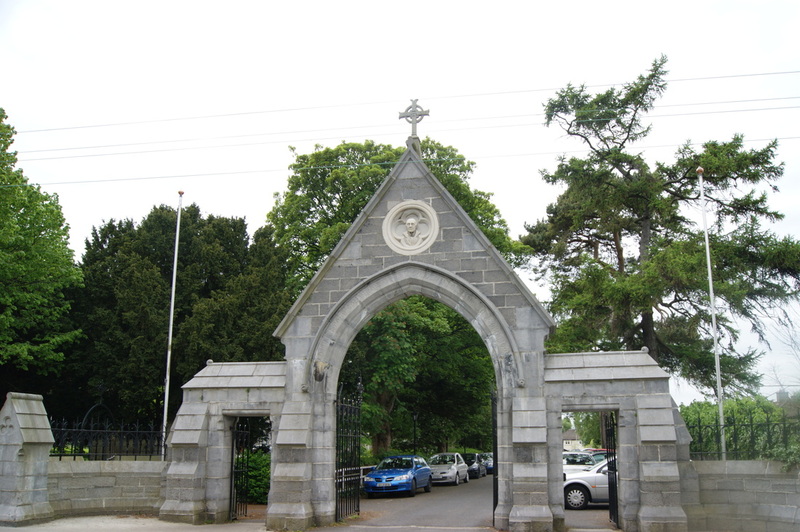 Tá an Séipéal Protastúnach suite trasna an bhóthair ón gcloigtheach. Séipéal Naomh Eoin atá ann agus tógadh é sa bhliain 1789. Is anseo a bhí an mhainistreach a thóg Naomh Crónán sa chúigiú céad. Bhí an cloigtheach ar an suíomh céanna leis an séipéal go dtí an bhliain1760 nuair a tógadh Bóthar an Túir. Bhí séipéal eile ar an suíomh céanna roimhe sin. Tógadh sa 13ú haois é.
Leagadh é sa bhliain 1787 chun an séipéal nua a thógáil. Níl fágtha den séipéal anois ach an seanbhalla seo. Tá an dá leac uaighe seo le feiceáil ag an mballa cúil i reilig Naomh Eoin.Tá beirt shagart Caitliceach curtha sna huaigheanna seo. Cé gur reilig Phrotastúnach í cuireadh daoine ó reiligiún eile ann san am atá thart. Tá an t-umar baiste seo le feiceáil ar an suíomh. Tá sé déanta d’eibhear (granite). 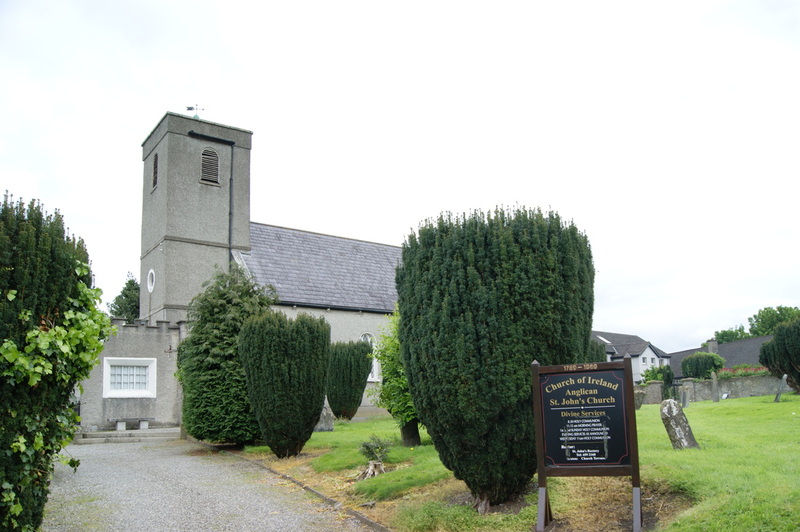 The Church of Ireland Protestant Church is situated across the road from the round tower. This is Saint John's Church and it was built in 1789. this is the site of the monastery founded by Saint Crónán. The church and the tower were on the same site until they were separated in 1760 by the building of Tower Road. There was a previous church on this site built in the 13th century. it was knocked in the year 1787 to make way for the current building. All that remains is this old wall. These two gravestones are to be seen at the back wall of Saint John's graveyard. Even though it is a protestant graveyard people of other faiths were buried there long ago. This stone Baptismal Font is to be seen on the site. It is carved from granite. sa lá atá inniu ann. Tá na tithe agus na gairdíní ar Bhóthar an Úllóird níos airde ná an bóthar de bharr go bhfuil siad suite ar an áit a raibh na seanbhallaí fadó.Tá 65 Cloigtheach in Éirinn faoi láthair. Bhí cloigtheach istigh i gclós na mainistreach go minic. Tógadh an cloigtheach taobh thiar den séipéal de ghnáth, agus doras an chloigthí ar aghaidh an tséipéil. Ciallaíonn “Cloigtheach” “Teach an Chloig”. Bhí clog mór iarainn ar crochadh as an díon sa seomra i mbarr an chloigthí. Nuair a chuala na manaigh an clog ag bualadh chuaigh siad chun guí sa tséipéal. Thog na manaigh cloigtheach chun iad féin a chosaint ar a naimhde. Nuair a chonaic siad an namhaid bhuail siad an clog sa chloigtheach. Bhailigh siad na rudai luachmhara ar nós leabhair, cailísí agus seoda, agus thug siad isteach sa chloigtheach iad. Nuair a bhí gach duine slán istigh, tharraing siad aníos an dréimire agus dhún siad an doras. D'fhan said ansin go dtí go raibh sé slán teacht amach. There were earthen and stone walls around the monastery to provide protection from wild animals and enemies. Orchard Road, Main Street and tower Road follow the outline of these walls. 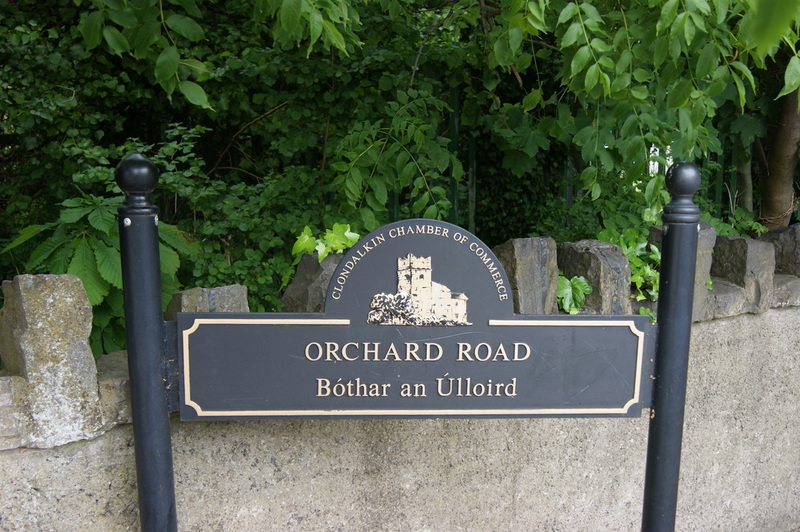 the houses and gardens on Orchard road are higher than the road because the are situated on top of these walls. Today there are 65 round towers in Ireland. Often the round tower was within the monastery enclosure. It was usually situated behind the monastery with the door facing the church. The Irish term for 'Round Tower' is 'Clogthí'. This means 'Bell House'. A large iron bell hung from the roof of the top room in the round tower. This was rung to summon the monks to prayer. The round tower was also built for protection. When the monks saw or heard an approaching enemy they collected their valuable books, chalices and other sacred vessels and took them to the tower. They then entered the tower, drew in the ladder, locked the door and waited for the danger to pass. From the ninth century onwards the monks made beautiful chalices and ornaments in their monasteries. The Ardagh Chalice is to be seen in the National Museum. Seo é an seanscoil Phrotastúnach atá suite ar Bhóthar an Túir. Tógadh sa bhliain 1867 í. 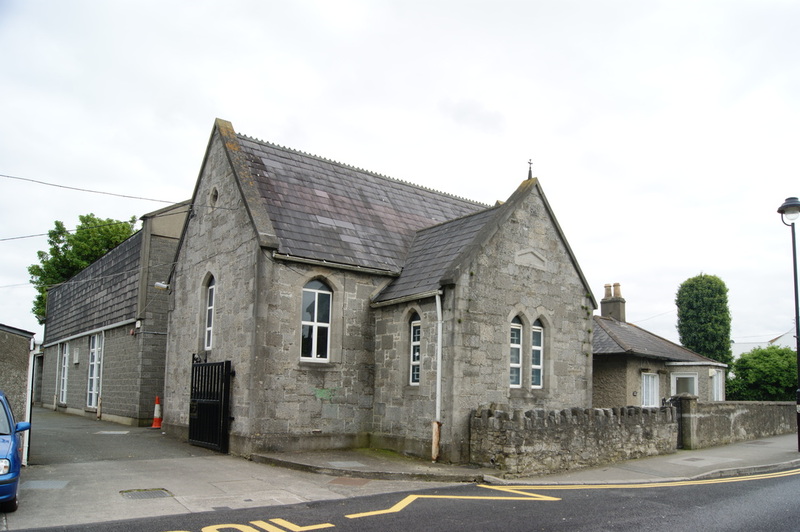 This is the old Protestant School situated on Tower Road. It was built in 1867. 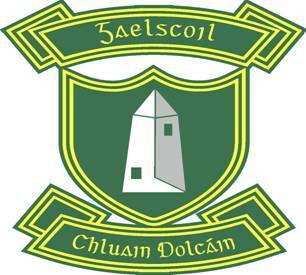 Tá na tithe seo suite in aice leis an seanscoil. Tógadh sa bhliain 1879 iad. 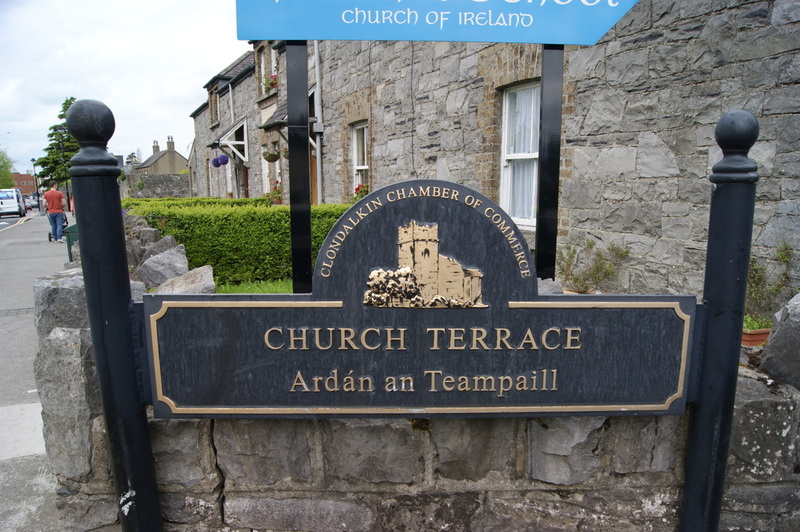 “Ardán an Teampaill” (Church Terrace) a thugtar orthu. Úsáideadh seomra amháin mar sheomra ranga nuair a tógadh ar dtús é agus ligeadh na seomraí eile amach ar cíos. Tógadh scoil Phrotastúnach nua, Scoil Naomh Eoin, sa bhliain 1963, agus tá sí suite díreach taobh thiar den sheanscoil. 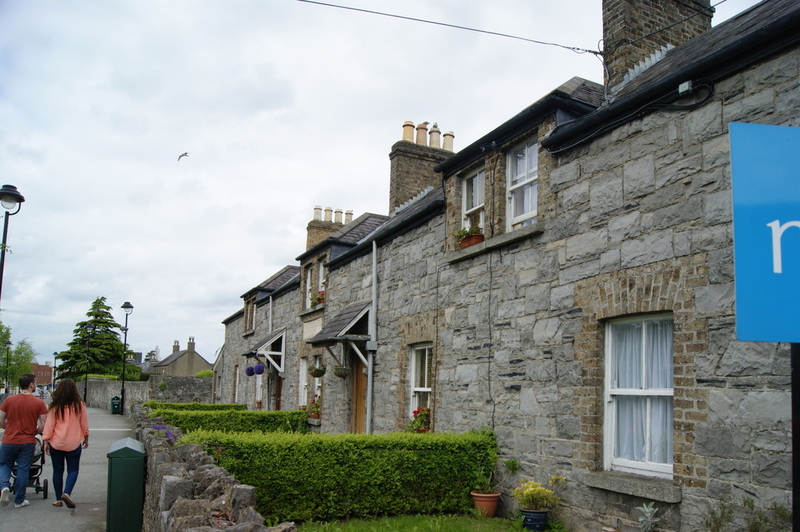 These houses are situated beside the old school. 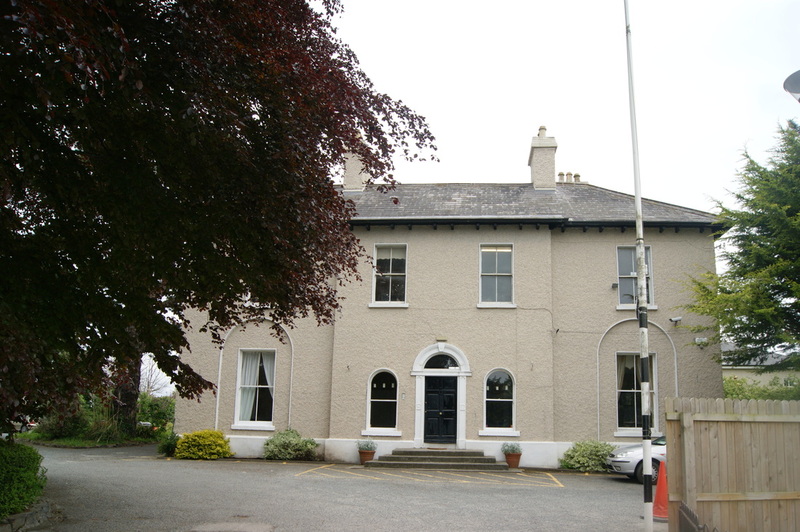 The four houses were built in 1879 and are known as 'Church Terrace'. 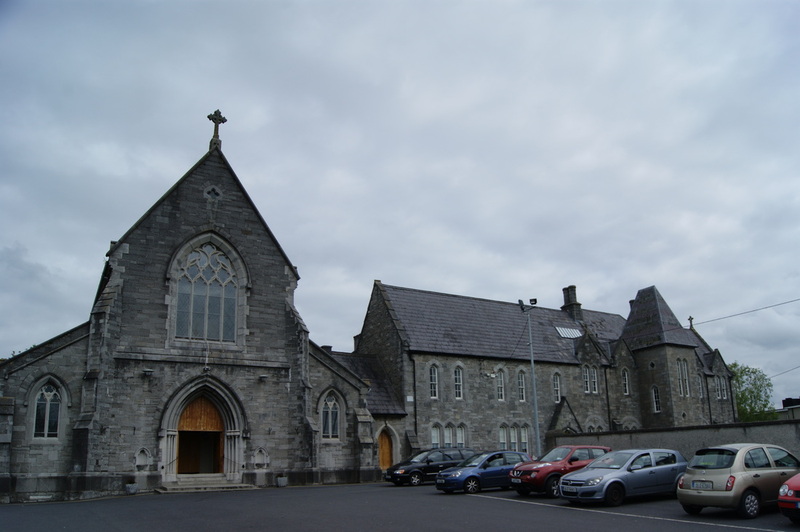 One room was used as a classroom at first and the other rooms were let.. A new Protestant School, Saint John's School, was built in 1963, and it is situated behind the old school. Tá Tobar Naomh Bríd ar an mBóthar Bhúit i gCluain Dolcáin. De réir na fínscéalta tháinig Naomh Bríd go dtí an mhainistir i gCluain Dolcáin agus bhaist sí pagánaigh ag an tobar seo. Ba chailín naofa í Bríd. Nuair a bhí sí an-óg shocraigh sí go mbeadh sí ina bean rialta. Chuaigh sí timpeall na hÉireann ag tógáil clochar. Chaith sí a saol ag tabhairt aire do dhaoine bochta. Rinne sí crosóg as luachra chun scéal Chríost agus conas a fuair sé bás ar an gcros a insint do dhaoine. Déanann go leor daoine in Éirinn crois as luachra ar Lá le Bríde, an chéad lá de mhí Feabhra, gach bliain. Tógadh na ballaí thart ar an tobar timpeall na bliana 1761. Chuaigh muintir Chluain Dolcáin ar mórshiuil go dtí an tobar gach bliain ar an gcéad lá de mhí Feabhra san am atá thart. Chreid daoine go bhféadfadh an t-uisce beannaithe sa tobar daoine a leigheas. 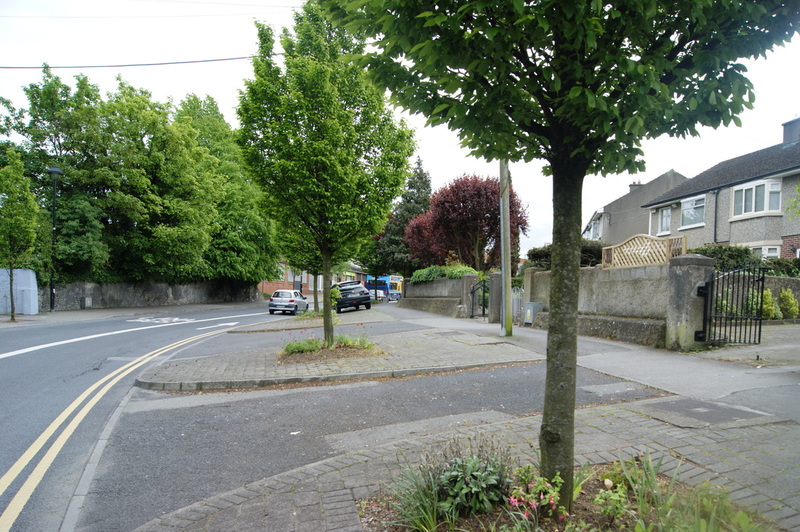 Saint Bridget's Well is situated on Boot Road in Clondalkin. 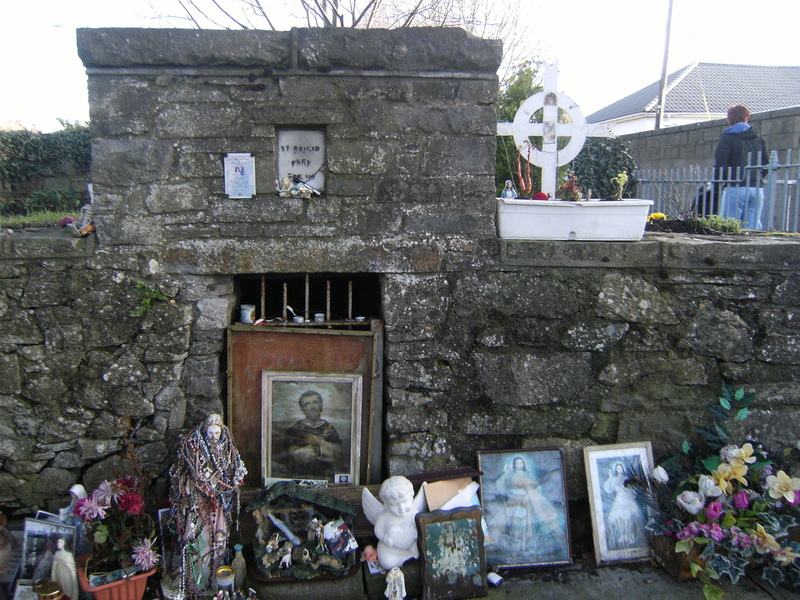 It is believed that Saint Bridget came to the monastery in Clondalkin and baptised pagans at this well. Bridget was a holy woman and when she was young she decided to be a nun. She travelled around Ireland founding convents. She spent her life looking after poor people and often made a cross from rushes to explain the death of Christ. Many Irish people make a cross from rushes on Saint Bridget's Day, the first day of February. The walls enclosing the well were built around the year 1761. 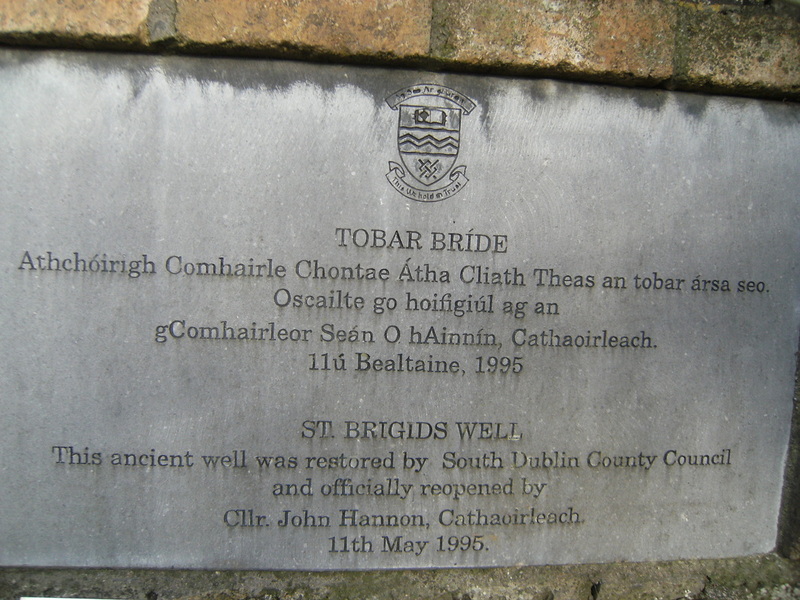 In times past the people of Clondalkin marched to this well on the first day of February. They believed in the curative properties of the well's water. Fadó, cheangail an Sagart a chapall don fáinne seo sa bhalla. 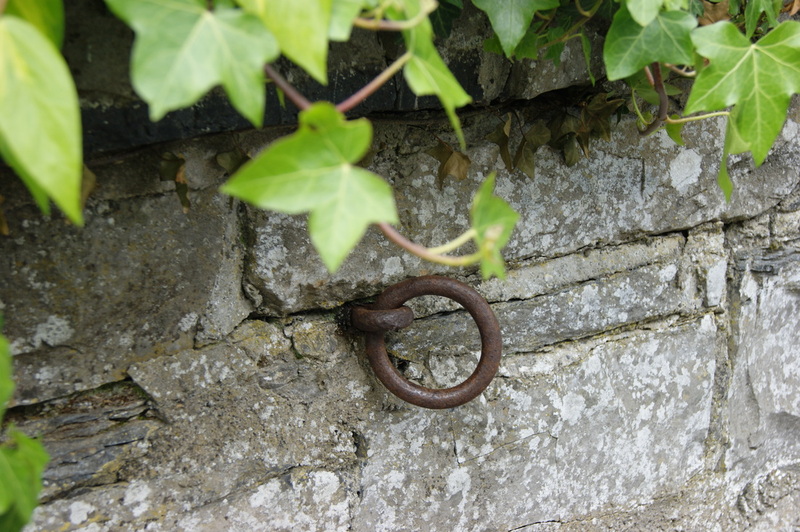 In bygone days the Priest tied his horse to this ring in the wall.